The FAI have issued written responses to the Oireachtas Committee. The FAI addressed why they did not include the €100K "bridging loan" in the Monthly Financial Accounts. According to the letter signed by interim CEO Rea Walshe, the "transaction did not affect the Profit and Loss account of the Association". The FAI also confirmed that they lodged the payment into the deposit account and this was followed by an "internal transfer" to the current account. On the matter of why other bank accounts were not utilised, the FAI responded that "all available funding" across its accounts had already been utilised. They also added information about "payments terms of the creditor" were "commercially sensitive". "Firstly, let us apologise for this late response however, as you will have seen today Mr Delaney has stepped aside from his role as Executive Vice President and we have had two resignations from the Board. "Further to our meeting with the Committee last week, queries arose and we had said we would revert as quickly as possible and in so far as we could, given the ongoing processes. "In relation to the queries raised please see our responses below." Auditing Process and whether auditors had access to all books and records including records of cheques? "As part of the audit process, we are obliged to provide and do provide access to all the books and records of the Association for the financial year." Does the FAI have an active Tax Clearance Certificate? "The Association holds an active tax clearance certificate, which confirms that all current and prior tax affairs are in order." "In 2013 the Association moved its overdraft facility from Danske Bank to Bank of Ireland. "In 2016 the Association successfully refinanced its bank loans from Corporate Capital Trust to Bank of Ireland. The amendments to the overdraft facility formed part of the restructuring." Why was the €100,000 not included in the Monthly Financial Accounts? "The monthly accounts presented to the Board and Finance Committee contain the Profit and Loss account which would be the normal way to assess the up-to-date performance of the business in relation to variances to budget. The €100,000 loan was accounted for in the balance sheet. Balance sheet accounts are reviewed by the finance team on a monthly basis. The transaction did not affect the Profit and Loss account of the Association." 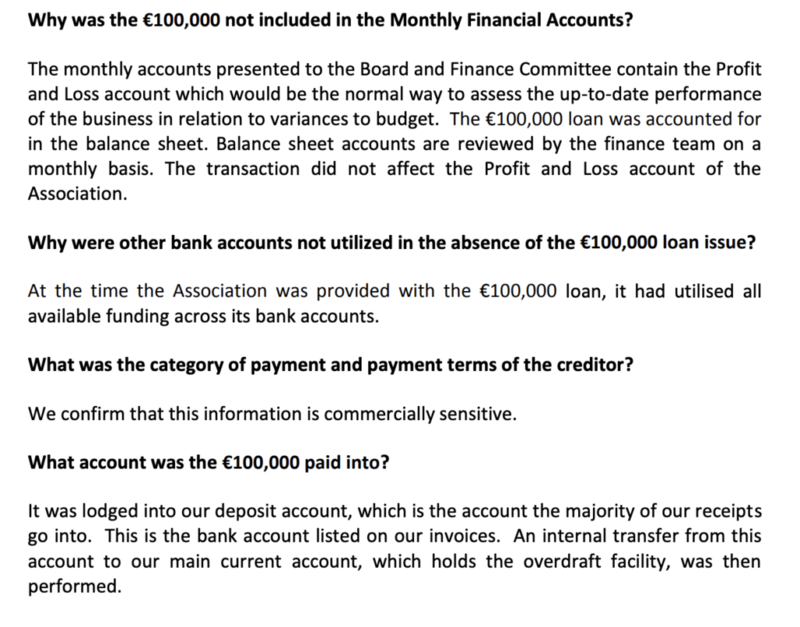 Why were other bank accounts not utilized in the absence of the €100,000 loan issue? "At the time the Association was provided with the €100,000 loan, it had utilised all available funding across its bank accounts." What was the category of payment and payment terms of the creditor? "We confirm that this information is commercially sensitive." What account was the €100,000 paid into? "It was lodged into our deposit account, which is the account the majority of our receipts go into. This is the bank account listed on our invoices. An internal transfer from this account to our main current account, which holds the overdraft facility, was then performed." What comprises the €430,000 contained in note 20 of the 2016 Financial Statements? 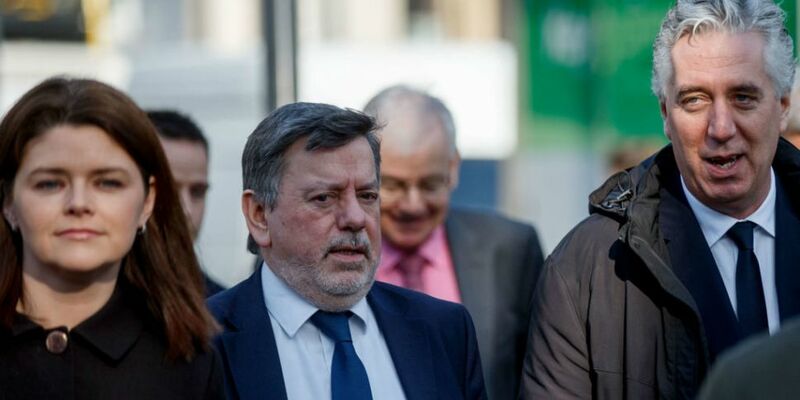 "The €430,000 related to the CEO’s salary and the honorarium to officers of the Board. If you have any further queries please do not hesitate to contact us."